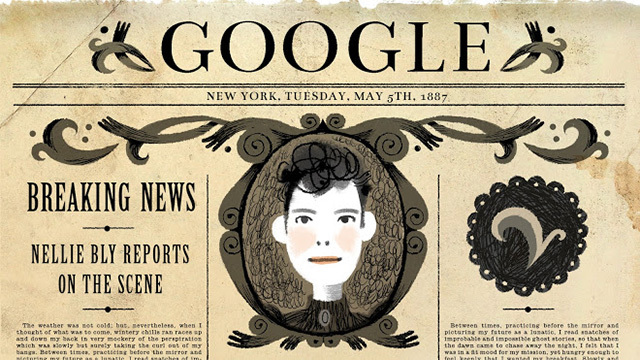 Today on the Google home page is a logo, Doodle, for the 151st birthday of Nellie Bly. Nellie Bly an American journalist named Elizabeth Cochrane Seaman (Nellie Bly was her pen name), is known for her amazing and incredibly exhausting journalist work. She did a trip around the world in 72 days and she even faked insanity to study a mental institution from within (now that is crazy). The music is "Nellie" by Karen O. It basically shows her work in the Doodle. Great idea for a Google Doodle!